McMullen Gallery and the Keiskamma Trust Art Project are partnering up for a new exhibit, known as Imbumba. 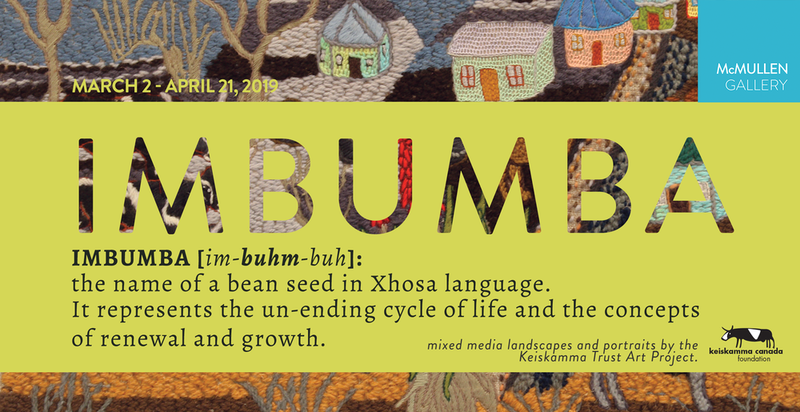 Appropriately named after a bean seed, Imbumba represents the unending cycle of life, and the concepts of renewal and growth. Included are portraits of people who are the life-blood of the community. Other works depict aspects of growth and life in the village and that of the natural world which sustains and feeds them. Marilène Oliver works with medical imaging data to create artworks. Since 2001, Marilène has worked with MRI and CT scans to create print based sculptures and installations that invite us to rethink medical scans, suggesting that they can reveal more than just a medical diagnosis. The work in Under the Surface is a part of a larger body of work Marilène has created based on medical data. Works such as The Kiss were made from bespoke data of subjects known personally to the artist and were acquired especially in order to make the work. These works took as their motivation a fear for the loss of embodied relationships in an increasingly digitized world, suggesting that medical data could become future relics to cherish and covet. Other works such as Dervishes and Womb Axis, were made using anonymized, open source data of subjects unknown to the artist. These works explored other aspects of the impacts of digitization on society – that of the need to create endless digital identities to perform and present. Oliver uses these technologies to reclaim the interior of the body and create artworks that allow us to materially contemplate our increasingly digitized selves. In order to create these artworks, Marilène has had to find innovative ways to get medical data in and out of software, create templates and plans for installations, registration maps for printing and vector paths for laser cutting. Here for the first time Oliver is presenting these process based works alongside her sculptures. They reveal a complexity that lie under the surface all of digital life; a nervous energy, a constant demand to hold everything together, to not mis-register a hole nor omit a check box. Also featured in Under The Surface is the collaborative outreach project Memory Bank, which was conceived especially for the this exhibition at McMullen Gallery. When Marilène saw her mother’s medical scans that diagnosed early onset dementia, she remembers feeling angry and frustrated: how could the scans show her my mother’s disease but not all the important memories her mother now had forgotten? Memory Bank will culminate in a dataset of brain scans that are made up not of grayscale pixels, but of real memories collected from patients in the hospital and visitors to the gallery. At the start of the exhibition the contour of brains scans will be installed in the gallery. Every day visitors, patients and staff will contribute memories that will be written into the brain by gallery staff. By the end of the exhibition the brain will be filled with memories, acting as unique portrait of all those touched by the project, connected in time and place, memories crystallized in an artwork: a collective consciousness. Marilène Oliver and McMullen Gallery welcome you to bring a written memory to the gallery to be added to the work or share a memory by emailing memorybankcollection@gmail.com.